The world famous Hayward Gallery in London, celebrated its 40th anniversary with an exhibition entitled ‘Psycho Buildings: Artists take on Architecture’ featuring a range of attention grabbing installations. 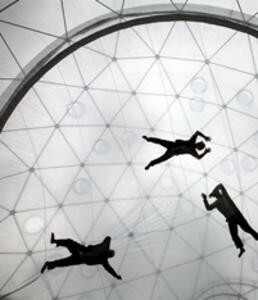 One such installation was a large inflatable geodesic dome entitled ‘Observatory: Air-Port City 2008’ by artist Thomas Saraceno, on which visitors could walk, sit and stand to create the illusion of a floating walkway. His Buckminster Fuller-inspired dome is made from transparent PVC coated polyester with a mirrored floor. Viewers from above can climb onto the top to observe the people below, who appear as though floating in a gravity-free chamber. Saraceno describes his own dome in this way: "Air-Port-City is like a flying airport. Up in the sky there will be this cloud, a habitable platform that floats in the air, changing form and merging with other platforms just as clouds do. It will fly through the atmosphere pushed by the winds, both local and global, in an attempt to equalise the (social) temperature and differences in pressure. It will be a sustainable and mobile migration. These aerial cities will be in a permanent state of transformation, similar to nomadic cities".